AMERICAN brat Jared Donaldson has been condemned by the tennis world after a furious outburst at an umpire. 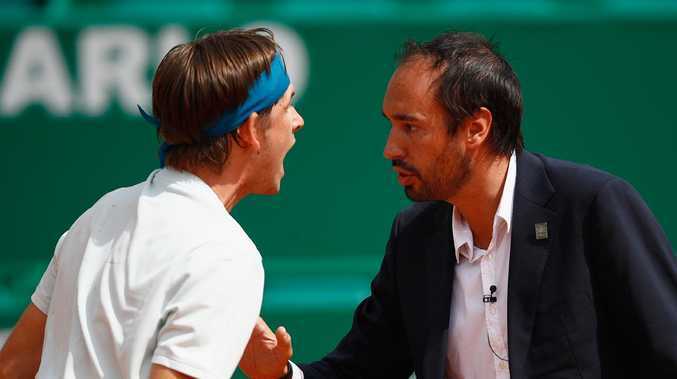 Donaldson squared up to French official Arnaud Gabas after losing his temper over a line call in bizarre scenes during a Monte Carlo Masters match on Monday. After Gabas got out of his chair to check a mark, Donaldson lost his cool when a serve from opponent Albert Ramos Vinolas was called in when he thought it was out. The 21-year-old Donaldson was adamant Gabas checked the wrong mark in the clay and squared up to the official while shouting at him and insisting that what the umpire was pointing at "wasn't a mark". He then refused to play the next game until a supervisor was called to the court, claiming: "I can call the supervisor whenever I want." Donaldson later offered Gabas a sarcastic apology, saying: "I'm sorry I hurt your feelings, I apologise." Hawkeye replays on television appeared to show that Donaldson was right about the serve, but Hawkeye is not used at the tournament. Last year's Monte Carlo runner-up Ramos Vinolas led by a set and a break at the time, and went on to win 6-3 6-3. Gabas has previous history with angry tennis players, suffering a fractured eye socket after being hit by a ball struck by an irate Denis Shapovalov in a Davis Cup match between Canada and Britain last year. Donaldson, who did not shake Gabas's hand after the match, earned the ire of tennis commentators.